Precision Sheet Metal Fabrication / Metal Stamping - Fast Delivery of Sheet Metal Work. The Marlin Steel manufacturing plant runs the best robotic equipment available, producing accurate, precision quality with fast delivery. Every aspect of your project is planned by our certified mechanical and design engineers. 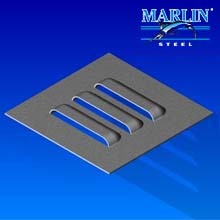 Marlin Steel is an Engineering Powerhouse recognized by major news agencies and publications around the globe.